This game has the hallmarks of being a very close contest, even if Birmingham did have the upper hand in the regular season, drawing at Bloomfield Road 2-2 before winning 3-0 at St Andrews. However, both sides are slightly different teams since that last contest and that provides for some interesting dynamics. Ian Holloway should have a virtually full strength squad to choose from. In terms of selection decisions the key one appears to be whether to select Barry Ferguson or Keith Southern to partner Angel Martinez as one of the holding midfielders in a 4-2-3-1. This selection dilemma has crept up on Holloway after Martinez has proved to be a superb midfielder, filled with vibrancy, technique and intelligence. His emergence in the final part of the season has meant that the two former mainstays of the midfield are battling it out for selection. The dilemma is enhanced because both players offer different skillsets, Ferguson holds his position more, whilst Southern is more of a runner and tackler applying almost constant pressure on the man in possession. Chris Hughton appears to have settled on a back four since Stephen Caldwell’s injury. In addition to this his midfield might see Jordon Mutch support Guirane N’Daw centrally flanked by the superb Chris Burke on the right and Andros Townsend on the left. Up front it’s possible in the away leg he may field Erik Huseklepp to sit slightly deeper than Marlon King who will be at the head of the attack in a 4-4-1-1. The second leg may see Hughton field Adam Rooney alongside King in a more traditional 4-4-2 set up. Holloway’s strategy will remain the same over both legs and is consistent with the attacking approach witnessed in the two other seasons he has managed Blackpool. Blackpool implement their attacking strategy slightly differently this season, there’s less emphasis on controlled possession and slightly more direct, counter attacking style utilising the pace he has on each flank. Hughton is likely to keep things compact at Bloomfield Road, using long balls to relieve pressure and build attacks. He’s likely to take a reactive approach to the second leg and adjust to suit the match position. As mentioned earlier the selection issue Ian Holloway has will dictate how his midfield will operate. The central battle has the possibility of being keenly fought. Holloway may field Ferguson for more assurance on the ball looking to hold possession solidly in the middle before moving the ball on to the forwards. If Holloway does this then it’s likely that N’Daw will be used to target one or both of the midfielders in order to win the ball back high up the pitch and unsettle Blackpool’s passing rhythm. However, Holloway may see N’Daw’s application as a threat and use Keith Southern to fight fire with fire so to speak. Both N’Daw and Southern are very similar players and should Southern get the nod, then it’s likely that battle will be very feisty with both managers aiming for their player to win their battles. The wide men from both teams have the ability to change this game with both sets of full backs due for a busy night. 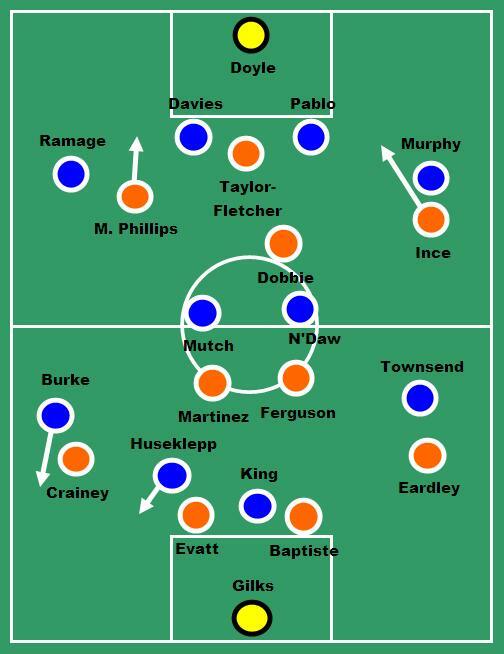 In more recent weeks Blackpool’s full backs have started to sit a little deeper and it may be the same in this match. Chris Burke has had an outstanding season with 12 goals and 16 assists from the right wing. Stephen Crainey will need to be alert at all times as Burke likes to cross early and can cut in to cross with his left as much as his right. He is also likely to try to cut inside to shoot as well, so Crainey will need to ensure that he passes on his marking of Burke effectively and the rest of the team are alert to his inside movement. In addition to Burke, should Huseklepp be fielded he’s likely to drift towards the right hand channel where he may combine very effectively with Burke to produce chances for himself or for King. Huseklepp has already scored twice against Blackpool for Portsmouth this season and his movement is superb as featured on this blog earlier on in the season. On the other hand Blackpool have two very exciting wide forward players. Tom Ince is more of a traditional winger, whereas Matthew Phillips is very much a powerful running forward. Both players are difficult to read on the ball and enjoy one on one duels. The key for Birmingham is not to allow Phillips or Ince to turn and run at their defence and Hughton may ask his side to tightly double mark them to try to nullify their threat. If Birmingham fail to stop Ince and Phillips from running at them then their centre backs will need to be alert and defend astutely on the turn to prevent their goal being exposed. As pointed out above Huseklepp could be very dangerous if selected because of his tendency to drift in to the right, however, Blackpool have an equally dangerous threat up front in the form of Stephen Dobbie. Since his return to Blackpool Dobbie has scored 5 goals in a 7 matches and always looks a threat due to his movement and willingness to shoot on sight of the goal. He is exceptionally hard to track as he moves around the field and should N’Daw move high up the field to press, Blackpool may seek to pass beyond him to Dobbie who will expose the space left behind. The role of the substitutes could be critical with both manager set to have great options available to them. Hughton will have the physical presence of Nikola Zigic to send on to disrupt the Blackpool defence, but more potently he has the young forward Nathan Redmond at his disposal. Redmond may even start the game, but it’s more likely Hughton will use him as an impact player. He’s already scored against Blackpool this season and may well replace Townsend after the hour mark to inject extra pace and trickery in to the proceedings. Or he may be asked to sit in behind Marlon King and run at defenders centrally which is a position he’s currently learning according to his recent interview with BBC West Midlands. Blackpool on the other hand have Kevin Phillips who is likely to start on the bench and come in to the action late on especially if Blackpool are chasing the game. He has scored 16 goals this season in a variety of ways and has such a fine appreciation of space which makes him very hard to track. He is single-minded and will shoot on sight but Birmingham will know all about him given he left the club last season. The other key option that Holloway has is the midfielder Ludovic Sylvestre, who has recently come on during games and settled the team down in midfield and sparked some high quality attacks with his excellent passing. This tie may well be tight from start to finish. Blackpool would potentially need at least a goal advantage to take to St Andrews as Birmingham have only conceded 14 times and lost once this season at home. Blackpool do have players who have exceeded expectations before, however, who wins this tie will have to keep excelling to beat either Cardiff or West Ham in order to get back to the Premier League.